Temporomandibular joint (TMJ) syndrome is a disorder of the jaw muscles and nerves caused by injury to the temporomandibular joint. The temporomandibular joint is the connection between the jawbone and the skull. The injured temporomandibular joint leads to pain with chewing, clicking, crackling, and popping of the jaw; swelling on the sides of the face; nerve inflammation; headaches, including migraines; tooth grinding (bruxism); Eustachian tube dysfunction; and sometimes dislocation of the temporomandibular joint. 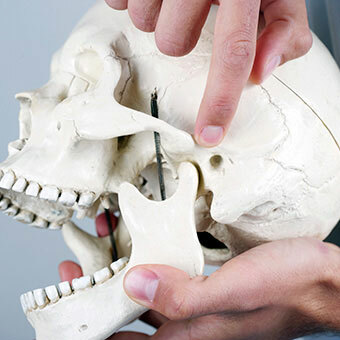 Temporomandibular joint syndrome is also known as temporomandibular joint disorder.